House Republicans and the government shutdown: Why is the GOP not bothered by brinkmanship? Why House Republicans have no problem taking us to the brink. Rep. Jim Jordan, R-Ohio, can afford to push so hard for defunding Obamacare because his home district is solidly Republican. Thanks, gerrymandering! On Saturday night, House Republicans declared victory in the shutdown wars—again. The Senate had given them a short-term continuing resolution that would fund the government until Nov. 15—funding everything, including the implementation of Obamacare. House Republicans responded with what several insisted was a “compromise.” The government would be funded through Dec. 15, but Obamacare would be delayed for another a year. What made this a “compromise,” anyway? It hadn’t been negotiated with Democrats; it had actually been pre-denounced, even by Democratic senators in conservative states. Burrow past the blandness of that quote and you’ll learn why the House GOP is so resolute in its repeal-Obamacare drive—and so unafraid of any negative consequences. Jordan’s central Ohio district is a slice of what pundits know as Real America, suburban and well-churched. But it’s roughly 9 points more Republican than the rest of the country, with a population that’s 90 percent white and wealthier (median income $45,326) than average. Mitt Romney, who lost Ohio in 2012, won 56 percent of the vote in Jordan’s district. Jordan ran ahead of Romney, easily dispatching a union organizer who raised $34,167 to Jordan’s $1,078,119. 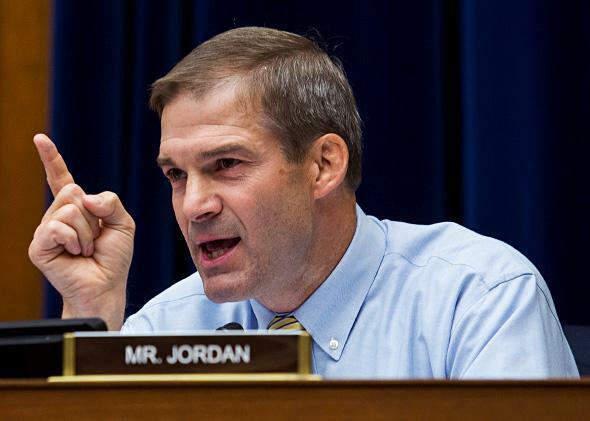 So the people Jordan hears from are inclined to be Republicans—especially when he holds a Tea Party town hall with the Firelands Patriots of Erie County, as he did at the end of the last congressional recess. When optimists try to predict the end of the government shutdown/debt limit wars, they suggest that Republicans will, eventually, have to buckle. Polls show that most voters blame them, not the president, for the quagmire—hey, who can argue with polls? History shows that Republicans were blamed for the winter shutdown of 1995–1996—who can argue with history? Republicans can, and they do. The gerrymanders of 2011 added to their natural geographic advantage over urban/suburban Democrats and gave them a House they simply don’t think they can lose. In 2012 they proved it, winning 1.36 million fewer votes than Democratic candidates but keeping a 33-seat majority. According to the Cook Political Report, 205 of 435 House districts are solidly Republican, basically impossible to lose without an unexpected bribery or sexting scandal. Only 163 districts are solidly Democratic. If Democrats swept the table and won all the districts currently rated as tossups or “leaning” Republican, they’d win 213 seats, five short of a majority. Ah, but the plan was supposed to complement a Republican win. The actual 2012 scenario—voters voting for Democrats at every level and getting Speaker Boehner—was an undemocratic fluke. That matters, because Democrats from Barack Obama on down are refusing to negotiate with Republicans over the government shutdown. Democrats won the election; Republicans, they say (and believe), lack the consent of the governed. A bored person with access to Google can find hundreds more quotes like that, but why bother? Cost and DeMint argued that the election wasn’t just about Obamacare, and it wasn’t. What’s more important, according to Cost, is that “the exit polls showed a plurality of voters opposing the president’s health care law.” True: According to the exit poll, 49 percent of voters wanted to repeal the Affordable Care Act, and 44 percent wanted to keep it. When the pollsters dug further, 26 percent wanted the law “expanded” and 25 percent wanted it completely repealed. It’s a divisive law. Just not as divisive as it used to be. The 2010 exit poll found that 48 percent of voters wanted Obamacare repealed, and 31 percent wanted it expanded. The electorate that re-elected Obama, less white and more liberal, was readier to keep the law.